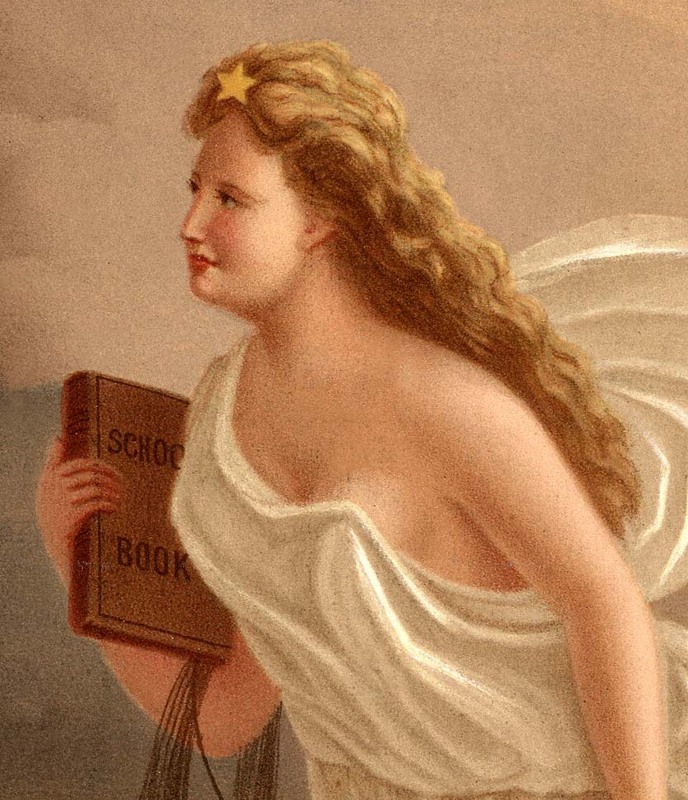 "IN HER RIGHT HAND SHE CARRIES A SCHOOL BOOK-- TESTIMONIAL OF THE NATIONAL ENLIGHTENMENT"
"In this painting, America is depicted as an angelic woman, who floats gracefully away from the cities in the east. She heads toward new lands in the west, carrying a book in her right arm, possibly symbolic of literature and culture, and gently lays the wire of the telegraph as she advances. The communication between lines will bind the nation. Following her footsteps are railroads expanding westward and farmers pushing the cultivating of new land with oxen and plows. The transportation of goods and services will strengthen the nation. Leading the pack are adventurers and hunters searching for new game, as well as caravans of settlers and wagons seeking new opportunities. The aspiring people will develop the nation. It is evident that wild animals, buffalo, and Indians are fleeing America’s approach, heading toward the mountainous, stormy region of the pacific. Nothing stands in the nation’s way as it continues to fulfill its fate of spanning two oceans. Gast’s American Progress was engraved and widely distributed to the masses to promote expansionism."